I'm often asked if our slipper orchids are carnivorous. They are not. 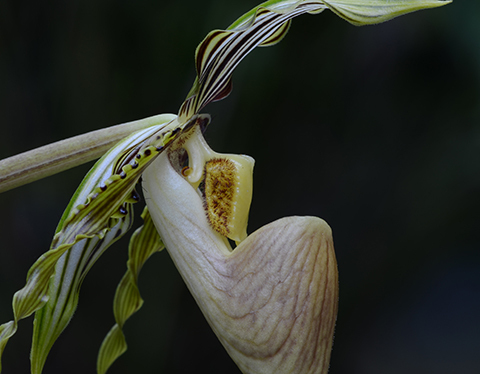 The pouch of the slipper orchid is instead involved in a fairly gruesome pollination mechanism. Many tropical Asiatic slipper orchids are pollinated by flies. The spots, bumps, hairs, carrion colors and foul odors produced by the flower attract flies seeking a food source. 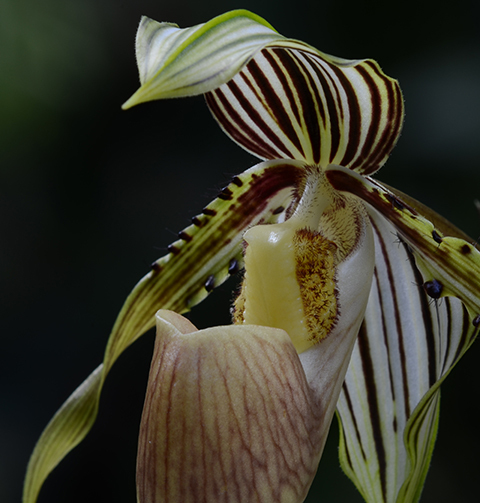 Paphiopedilum glanduliferum is pollinated by hoverflies (Syrphidae) which normally lay their eggs on aphid colonies. Aphids are the food source for the larval hoverflies. The glandular hairs in the center of the flower may mimic an aphid colony. Pollination takes place when the hoverfly becomes trapped in the pouch of the flower. The escape route forces the hoverfly in close contact with the pollen masses. As a result the fly often departs for another flower with the pollen attached to its body. We don't have hoverflies in the Fuqua Orchid Center. Even if we did we would prefer to hand pollinate our orchids (using a pencil, very low tech) so that we know which plant contributed the pollen and on what date. A "controlled cross," in other words. 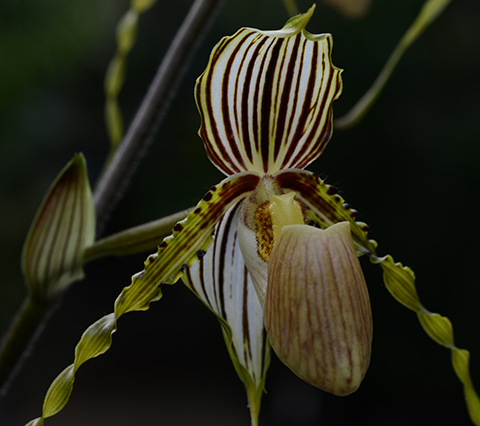 There are always Paphiopedilum orchids in flower in the Fuqua Orchid Center. We will be happy to point them out to you.